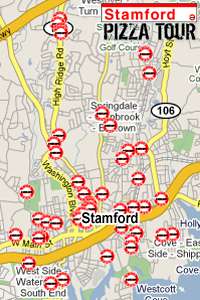 We're up to date and The Stamford Pizza Tour is live. The Tour started well before we had the brilliant idea to provide this wonderful public service and blog about it. So like, you're welcome. Anyway, for the past few days we've been scraping everything together to write reviews on all the places we've been to (with scorecards) thus far. There's an updated list of all our stops (Pizzas Toured, right side) for all to see. Read them. From now on, we'll try to hit at least two new restaurants every week, so if you don't see your favorite place on deck, fear not. We'll get to it. Incidentally, any recommendations you may decide to make are more or less futile, as we've put the names of every pizza place in Stamford that we, the yellow pages, and urbanspoon.com could come up with into a Blues Brothers-style fedora and will be drawing from it as the need arises. If somehow you still think your favorite pizzeria got lost in the wash, by all means, let us know.